Hyssop (Hyssopus officinalis) is a hearty perennial shrub in the mint family that has a spiky, upright habit and narrow tongue-like leaves. It's a dark, vibrant green when it gets enough nourishment, and sports small, vibrant blue flowers (some variations produce pink, lavender, purple or white flowers). It has an attractive appearance in the garden, but where it really shines is as an herbal remedy. It's also a flavorful addition to salads, soups and stews. Bees love hyssop and it's also a favorite with butterflies and hummingbirds. As a companion plant, it can help keep a few unsavory visitors from the garden too. It repels flea beetles and cabbage moths, so keep it around your cabbage crops and grape vines. Hyssop loves hot, strong sunlight and plenty of it. It needs well drained soil and likes dryer conditions. If you have a rocky spot that bakes in the afternoon sun, it's probably a good location for a hyssop bush as long as you loosen the soil well and add some sand. Growing to about two and a half feet tall and 15 inches across, hyssop has narrow, upright, woody stems. Plant seedlings two feet apart, and halve that if you'd like to train your hyssop plants into a border hedge. As herbs go, hyssop is one of those reliable performers season after season. The plant gets rangier and woodier as time goes by, so plan on replacing plants every four years or so. Propagate hyssop by starting seeds indoors eight weeks before the last frost date in your area. You can also create new plants easily by root division in fall. Dry stems indoors and harvest only the leaves. The woody stems lack flavor. To harvest seeds, let the seed pods brown and dry out completely. The seeds will be easy to remove and store in a dry, dark place over the winter months. Hyssop leaves are high in volatile oils that give the plant a distinctive camphor scent and slightly bitter taste. Hyssop has been used traditionally in the production of liquors and perfumes. It's has culinary applications both fresh and cooked, but hyssop's strong flavor can be an acquired taste. Hyssop is an antibacterial that's sometimes used to treat upper respiratory ailments , like nasal congestion, asthma and bronchitis . It's also an astringent (used in skin care products), expectorant, and may help reduce the symptoms of rheumatism. If you're planning on using hyssop for medicinal purposes, check with your doctor and always start with a small dose. Some potential side effects are: nausea, dizziness and diarrhea. 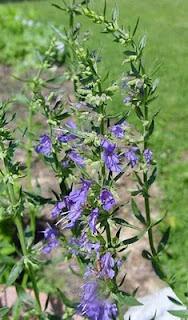 Special Note: Hyssop , a native to the Mediterranean, has been naturalized in the U.S. and Canada. A number of native American plants also go by the name hyssop but aren't related to Hyssopus officinalis. Verify that you have the right plant before you use it in your recipes and other preparations. do you know where I can find this either for sale of planting it in my garden?